Wouldn’t it be nice if you could see a larger preview of an image without having to actually open the photo? That’s exactly what FastPreview does, and it does a pretty awesome job of it. 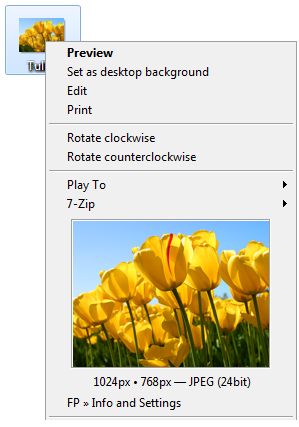 All you have to do is right-click on the image file and a larger preview will be shown right there in the context menu. It’s nice being able to adjust the preview size, but using a significantly larger preview will mean that the menu is a little harder to navigate. The good news is that this preview only shows up for image files so you won’t always lose that valuable space.